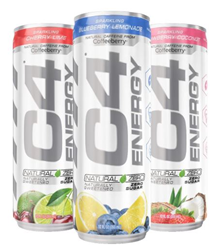 C4® Energy Natural Zero is designed to provide a quick pick-me-up or natural boost at any time of the day. Every 12-ounce can is naturally sweetened with Stevia Leaf Extract. The product is launching in three mouthwatering flavors: Cherry Lime, Strawberry Coconut, and Blueberry Lemonade. As the makers of America’s best-selling pre-workout brand C4® and a global leader in sports nutrition, Cellucor® has been committed to making fitness accessible to all since 2002. Since its launch in 2011, C4® has become the undisputed pre-workout champ, with over 1.5 billion servings sold. Today, Cellucor® makes a full range of clinically studied, cutting-edge supplements and on-the-go drinks for athletes of all levels and goals. You can find Cellucor® and C4® in some of the world’s largest specialty shops, big box and online retailers, and a rapidly growing list of convenience stores. To learn more, visit https://cellucor.com/. Cognizin® Citicoline, manufactured by Kyowa Hakko Bio Co., Ltd., is a clinically studied and patented form of Citicoline, a potent brain health nutrient found naturally in the body. * A proprietary form of citicoline, Cognizin® has been clinically studied to support mental energy, focus, and attention. Cognizin is manufactured through an innovative fermentation process to yield high quality and high purity. Cognizin is also highly stable, self-GRAS, 100% pure and allergen-free. For more information on Cognizin, visit Cognizin.com. ^Based on sales of all C4® brand products in the U.S.A. from 2014 to the present.